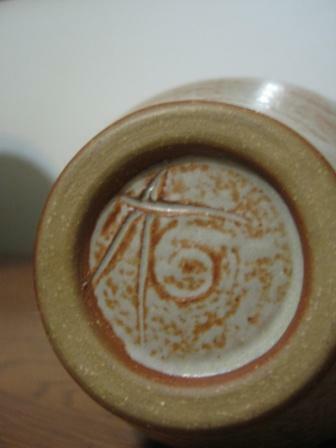 Do you recognize these pottery marks? A little help please. Does anyone recognize these artists’ marks below? The first may have Inuit connections from the ’60s or ’70s even though the signature itself does not appear Inuit. The clay seems to be a heavily grogged stoneware. The base looks as though it was cut straight from the batt. The second may have come from the London region. 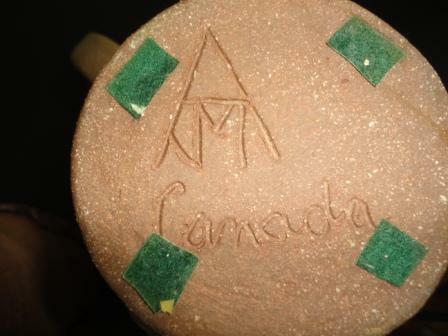 The foot is trimmed with the signature incised before the glaze firing. Just leave a comment to this post. Many thanks for any help. This entry was posted in Ceramics, Signature/Mark/Chop and tagged ceramic pottery, mark, signature on September 2, 2013 by Barry Morrison. Sorry Barry but I do not recognize them. Thanks, Ann. It seemed a bit of a long shot. Maybe someday someone will recognize them. I know the BC Potters Guild and a PEI site are researching marks/signatures/chops but it is slow going generally. Many thanks, Debra. How is the signature/mark/chop project by the BCPG going? Hi Barry, I forwarded these marks to John Lawrence at Do Da’s, and to Santo Mignosa. Interestingly, in the 60s Santo taught four Inuit students at the Kootenay School of Art, and in both 66 and 67 that class won the silver medal for the school entries, at Faenza, Italy. I have no idea what the work looked like. Thank you. I have forwarded your comment to Debra. Your website page on Makituk is most interesting.